I know I've said this before, but it bears repeating - there is no more clear spiritual successor to legendary Japanese filmmaker, Yasujiro Ozu, than Kore-eda Hirokazu. Through films like Still Walking, I Wish, and Like Father, Like Son, Hirokazu has inherited the mantle of the foremost chronicler of the Japanese family, crafting touching, often heart-wrenching, explorations of familial relations and their often complex dynamics. Despite a plot ripe for soap-opera histrionics, his latest film, Our Little Sister is perhaps one of Hirokazu's most subdued films. That's saying something for a filmmaker whose trademark is a kind of restrained serenity, but here he never tips the scale toward overt emotionalism as he has in previous films. Our Little Sister is the story of three sisters, who discover they have a teenage half-sister through one of their late father's affairs. Rather than shun her, they offer her a place to live, and give her a new lease on life by putting aside their distaste for her mother, the woman who broke up their family. Despite some brief objections from their own mother, Hirokazu mostly avoids the drama inherent in such a potentially explosive situation, and instead focuses on the developing relationship between the four young women. 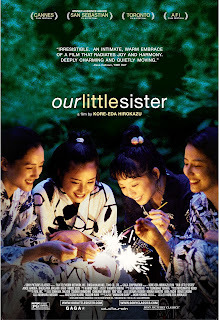 It is ultimately a film about the bonds of sisterhood, and Hirokazu guides it with remarkable grace. Family relationships are a strong theme in Hirokazu's work, much as they were in Ozu's, and while Hirokazu sometimes skirts sentimentality in ways that Ozu mostly avoided, it's hard to ignore the strong bond that unites their body of work. Like Ozu's work, Our Little Sister a slow burn, taking its time developing its characters and watching them grow, and it lacks a final "payoff" moment, but it rewards our patience with an undeniable charm. It's a lovely and lyrical film that deftly avoids emotional fireworks for something much more honest. 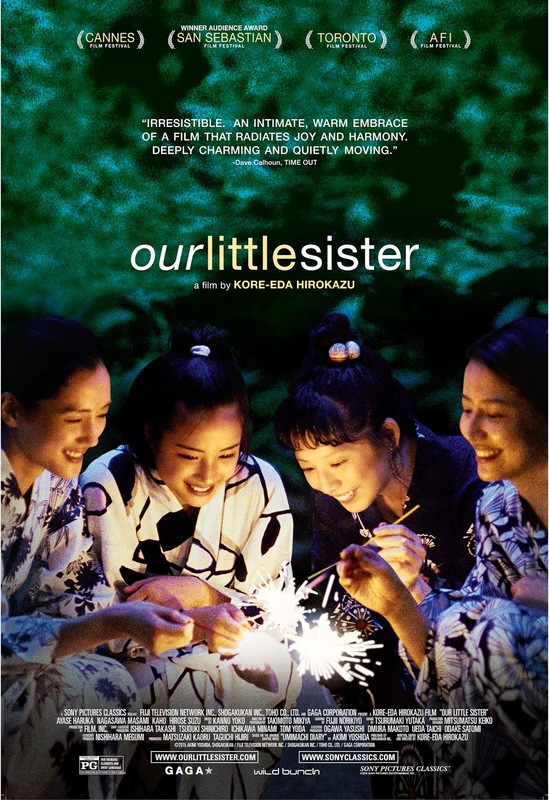 OUR LITTLE SISTER | Directed by Kore-eda Hirokazu | Stars Haruka Ayase, Suzu Hirose, Kaho, and Masami Nagasawa | Rated PG for thematic elements and brief language | In Japanese with English subtitles | Now playing in select cities. Opens today, 8/19, at the Ballantyne Village in Charlotte.